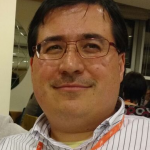 José María has designed and prepared the setup, deployment and integration of LDAP and CAS (Centralized Authentication Service) in RD-Connect Plaform, as well as the REST API and front-ends needed to manage the RD-Connect users and groups in the platform. José María studied Computer Science (BSc) at the University of Málaga in 1999, getting the MSc in Computer Science in 2002 at the Universidad Autónoma de Madrid. He has been working in bioinformatic research since 1999, first in CNB-CSIC (Spanish National Center of Biotechnology, 1999-2006), then in CNIO (Spanish National Cancer Research Centre, 2006-2017). He is currently working as senior research scientist at BSC-CNS (Barcelona Supercomputing Center, since 2017), also afiliated to the Spanish node of ELIXIR. He has worked in very diverse international projects, like REGIA, PlaNet, ORIEL, EMBRACE NoE, ENFIN NoE, ICGC (International Cancer Genome Consortium) or BLUEPRINT, and ELIXIR-EXCELERATE.